These two weeks I was on Chiffon baking mood together with Maameemoomoo where we troubleshoot problems like our oven temperature, baking time, cake texture and etc which was indeed a fun and fulfilling experience for both of us. And as some of you might know, I am an adventure baker/cook who always like to experiment with new ingredients, kitchen gadgets and etc. 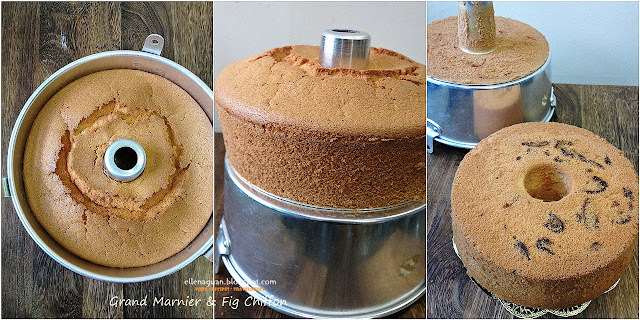 So for this post, I would be sharing 5 different chiffon cakes recipes from traditional Pandan Chiffon to something fusion like Rose Tea Chiffon which I hope there is at least one that captures your heart. Gula Melaka Chiffon is one of my latest Chiffon experiment inspired by the Pandan Sponge Cake with Gula Melaka Cream which I baked recently. And just for sharing, Gula Melaka is also known as Palm Sugar which is made from the sap of the palm tree. We simply adore this cake as it could be eaten either plain on itself own with a light "coconut" fragrance or you could drizzle some extra gula melaka syrup like what I had above. I promise the combinations are so addicting that you can't stop for just a slice. *For this recipe we used large eggs with an average weight of 60g and coconut cream could be replaced by fresh milk for a lighter taste. 1. 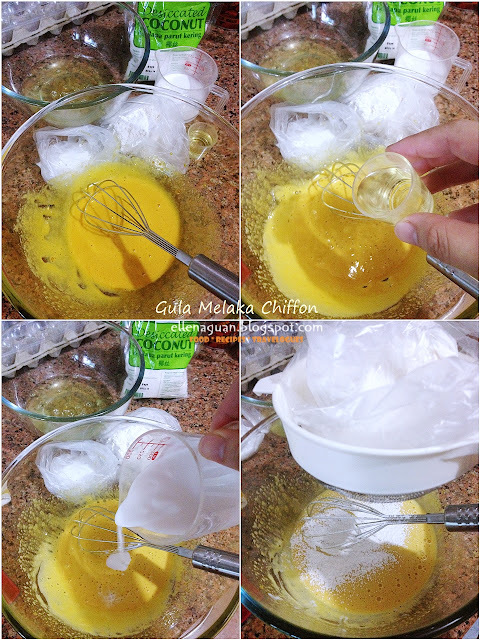 Whisk egg yolks and gula melaka sugar until thick and pale (make sure gula melaka is completed dissolved without any lumps). Stir in oil and coconut cream in sequence until everything is well combined. 2. 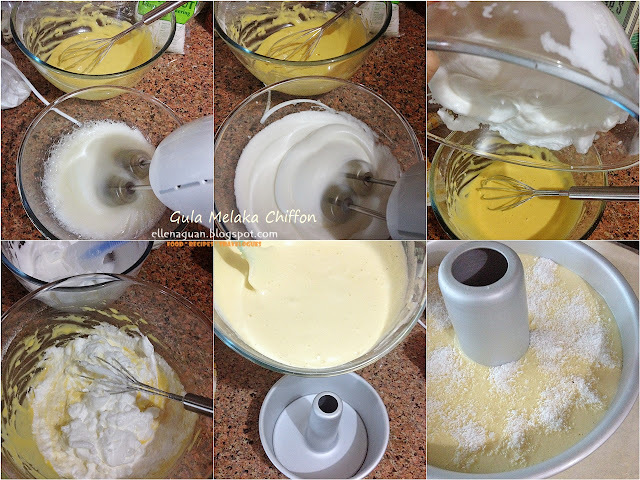 Next slowly whisk sieved flours (cake flour and baking powder) into the egg mixture till no trace of flour is found. Set aside. 3. Preheat the oven to 170°C (degree Celsius). 4. 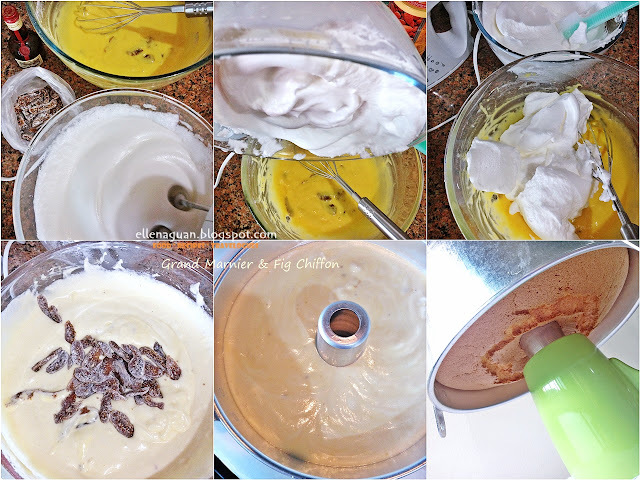 Beat egg whites with an electric mixer until foamy then gradually add in caster sugar and continue to beat on medium speed until stiff peaks form (the whole process takes less than 5 minutes and the egg whites remains in the bowl when it is overturn). 5. 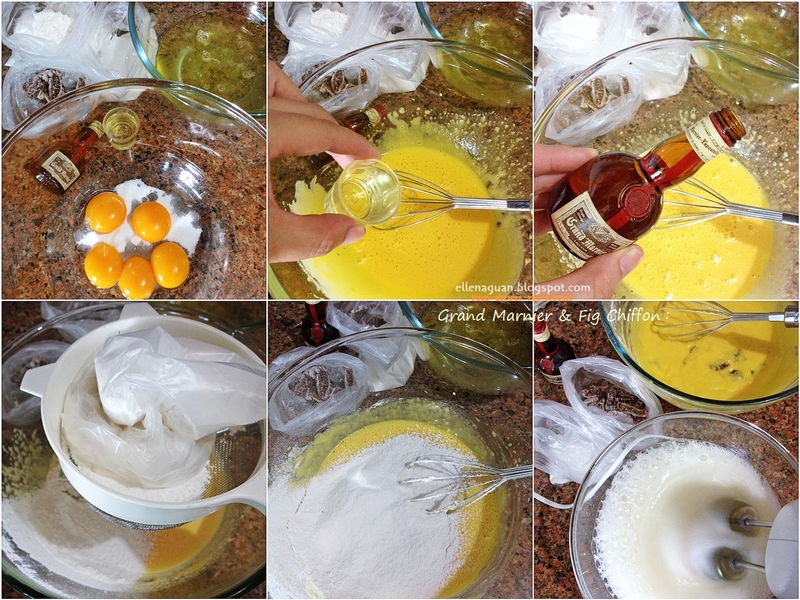 Using a balloon whisk carefully whisk in the stiff egg whites into the egg yolk batter in 3 separate additions, with the 1st addition to incorporate the whites into the yolk mixture leaving no trace of whites. 6. Next add in 2nd and 3rd additions of whites using the balloon whisk in a gentle manner in order not to knock off the air in the whites. Just fold till no trace of whites and the mixture are well combined. 7. Lastly lift up the bowl to height, pour the mixture into the tube pan and tap the pan once or twice on a table top to get rid of any trapped air bubbles in the batter. 8. Sprinkler the top with dessicated coconut and bake the cake in preheated oven (2nd lower rack) for about 28 - 30 minutes or when the surfaces turns golden brown (you can insert a skewer into the centre and test if it comes out clean). 9. Remove it from the oven and invert the pan immediately to let it rest on top of a cup. Make sure it cool completely before unmould. 10. To remove the cake from the pan, run a thin-bladed knife (i use a small plastic spatula) around the inside of the pan and the center core. 11. Release the cake and run the knife/spatula along the base of the pan to remove the cake completely. 12. Drizzle some gula melaka syrup on the cake and serve. A short video clip on how to make Gula Melaka Chiffon. It took me quite a few months to a year before I manged to grab hold "Black Glutinous Rice Flour" to try out this recipe. I remembered the very first time I read about Black Glutinous Rice (Pulut Hitam) cake was from @Køkken where the author shared her recipe on Pulut Hitam Pound Cake and I felt in love with it on first sight. And till recently I was once again inspired by another IG (Instagram) friend, @carelorie who baked two beautiful Black Glutinous Rice Chiffon Cakes. So when she shared she got her Black Glutinous Rice Flour from Bake King, I was excited to grab a packet too. 1. Whisk egg yolks and 30g of caster sugar until thick and pale. Stir in oil and coconut cream in sequence until everything is well combined. 2. 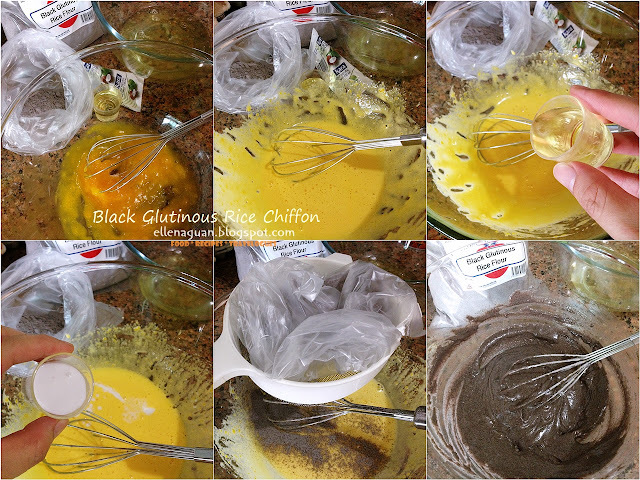 Next slowly whisk sieved black glutinous rice flour into the egg mixture till no trace of flour is found. Set aside. 8. Bake the cake in the preheated oven (2nd lower rack) for about 28 - 30 minutes or when the surfaces turns golden brown (you can insert a skewer into the centre and test if it comes out clean). 9. Remove it from the oven and invert the pan immediately (refer to the photo above) to let it rest on top of a cup. Make sure it cool completely before unmould. 12. Cut into slices and serve or keep in the fridge for an hour or more and serve as cold dessert. In order to achieve a similar after taste like the Pulut Hitam dessert, I used only black glutinous rice flour instead of a mixture with cake flour. And also I replace the usual water/fresh milk with coconut cream to enhance the flavour and aroma too. Grand Marnier Fig Chiffon is heavenly infused with orange scented fragrance that comes from "80ml" of orange-flavored brandy liqueur. It was my first attempt using purely liqueur instead of a combination with water (water + liqueur) in chiffon cake and I must admit it really taste good especially with the paring of those big plump organic dried fig that I got from Maameemoomoo which add additional sweetness and bites to the spongy texture. 1. Whisk egg yolks and 50g of caster sugar until thick and pale. Stir in oil and Grand Marnier liqueur in sequence until everything is well combined. 2. Next slowly whisk sieved flour into the egg mixture till no trace of flour is found. Set aside. 3. Preheat the oven to 170°C (degree Celsius) and at the same time dust (remove any excess flour) the fig slices with some cake flour and set side. 7. Lastly gently fold in the flour coated fig slices then lift up the bowl to height, pour the mixture into the tube pan and tap the pan once or twice on a table top to get rid of any trapped air bubbles in the batter. 8. Bake the cake in the preheated oven (2nd lower rack) for about 40 minutes or when the surfaces turns golden brown (you can insert a skewer into the centre and test if it comes out clean). 12. Serve chiffon cake with a cup of fruity or citrus tea as a refreshing afternoon break. When it comes to weekday breakfasts we always have either toast with spread (like nutella, butter, jam, cream cheese and etc), oatmeal or homemade granola with milk. But sometime when we crave for something old school, I will bake our all-time favourite Pandan Chiffon. And if you have ample time to spare in the kitchen, I would encourage you to blend your own pandan juice instead of using pandan paste or essence for a better taste and fragrance. Another version of Pandan Chiffon using pure pandan juice is available here. 1. Whisk egg yolks and 25g of caster sugar until thick and pale. Stir in oil and coconut cream mixtures (coconut cream, vanilla extract and pandan paste) in sequence until everything is well combined. 2. Next slowly whisk sieved flours (flour and baking powder) into the egg mixture till no trace of flour is found. Set aside. 7. Lastly pour the mixture into the tube pan and tap the pan once or twice on a table top to get rid of any trapped air bubbles in the batter. Lastly for tea lovers! This is something that you won't want to miss. Imagine having a cup of hot tea with a slice of rose scented chiffon cake while catching up with your favourite book or having friends over for gathering. I am sure you and your family or guests would definitely love this. 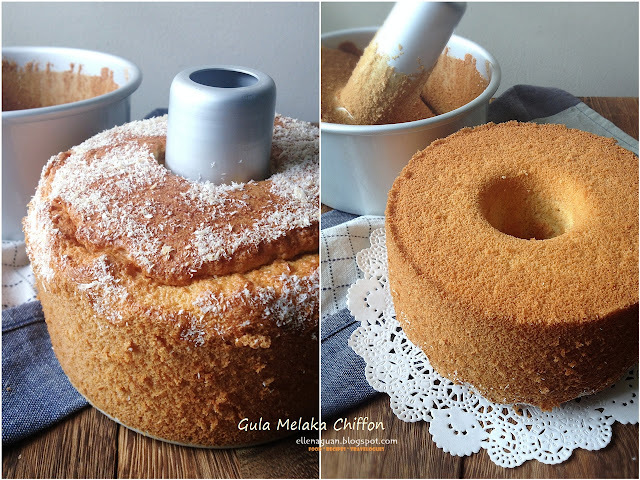 Recipe for this Rose Tea Chiffon Cake is featured over at Bake King recipe site here. 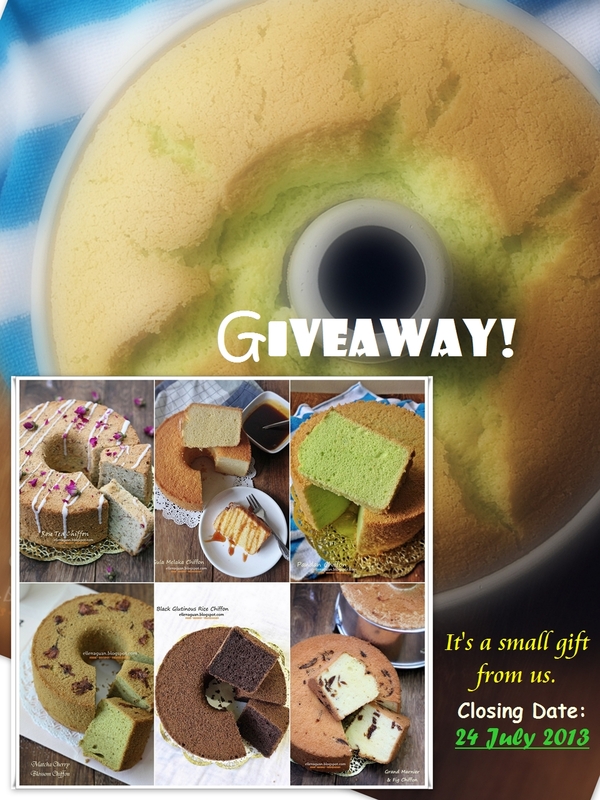 For more chiffon cake photos and recipes, you could also refer to our facebook page here. Till then happy baking!!!! Between for SINGAPORE readers who love chiffon cake, there is a little gift from us over at our Facebook page HERE which you might be interested to take a look too and win a 17cm homemade chiffon of your choice from us. I love love the hitam chiffon. The last I had one was really nice texture but that one was made from black glutinous rice from scratch and it was way too tedious. Will bookmarked yours. Gosh! 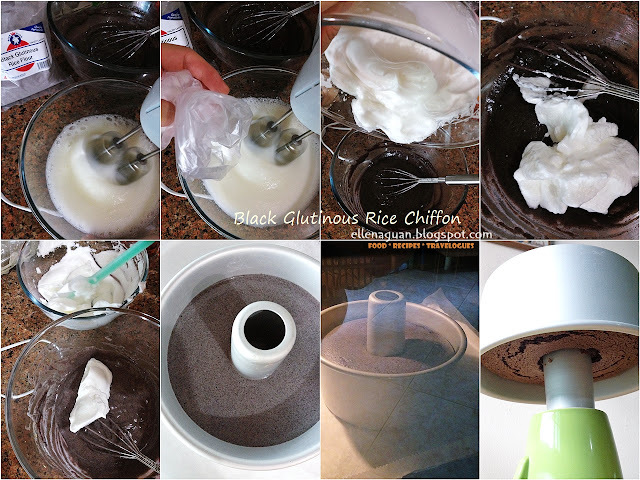 make the Glutinous Rice Flour from scratch will be definitely tedious than what I am using :) But if you could get hold of the ready BGR flour, it will really save up some time. Thanks Lee Mei :) How have you being? I love chiffons and have been baking them, recently i made a new orange ginger twist too. I am excited and very happy to see more new flavors for me to try out. Thanks for the sharing! Hi Lite Home Bake! Wow! Orange ginger sounds sound! Will like to give it a try too! My family love chiffon cakes. Your hitam chiffon looks very unique!! Ellena, you're very creative!! I love all the flavours you made especially rose tea chiffon cake. Hi Food For Tots! Thanks for your encouragement :) I love your recipes too! i have started baking recently and my first attempt with a pandan chiffon cake was a successful one! So i went on to bake a durian chiffon and a lemon chiffon. The latter 2 tasted great but the texture was a bit more dense at the bottom. The lemon one particularly was very dense at the bottom and the surface was moist next morning. Do you know what might be causing this? i am using a fan-forced oven at 160 degrees and i baked the cakes for around 40 minutes. Hope to hear from you soon and thank you in advance! May I know the brand of rose water you are using please. I was just looking through your chiffons and i see that yr chiffons all rose really nicely with minimal cracks! 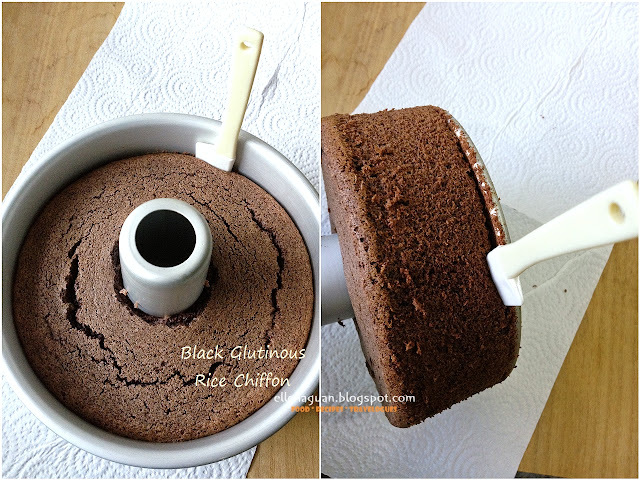 How can we ensure that the chiffon will rise nicely during baking? Not only does my chiffon suffer from cracks, but sometimes there is uneven rising too especially on the sides! Do you have any tips to impart? Many thanks in advance! Can u please advise where you purchased your 17cm chiffon cake tin ( without legs ) used in your Black glutinous rice Chiffon cake?